Josh graduated from Rhodes College in 2007 with a BA in Political Science. He then commissioned as a 2nd Lt in the Marine Corps and completed the Basic School and Infantry Officer Course. Josh was subsequently assigned to 2nd Battalion 1st Marines where he served as a CAAT Platoon Commander in Weapons Company. Over the next three years he deployed to Iraq and Afghanistan in support of OIF and OEF. Following this he was hand picked to serve as the Officer in Charge of the I MEF Special Operations Training group (SOTG) Assault Climber Branch until 2012 when he attended Assessment and Selection for Marine Special Operations Command (MARSOC). 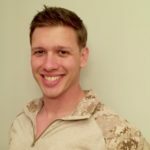 Josh completed selection and the Individual Training Course (ITC) and was assigned as a Team Commander for 2d Marine Raider Battalion, where he deployed to Jordan. Finally, Josh served as 2d Battalion’s Assistant Operations Officer before transitioning out of the military. He will be attending Northwestern University’s Kellogg School of Management in the fall of 2016 and looks forward to helping other veterans with their transition process.